My father was always behind the wheel. Strapped into life jackets, my brothers and I always stood at the bow of the boat and clutched the railing as we made our way out to that day’s fishing spot. We used to scream at the top of our lungs when the boat would hit a large wave and spray salty water in our faces. Standing on the bow of the boat was a fishing trip tradition as much as munching on Lance cheddar cheese crackers, my brothers getting sea-sick, the frequent applications of sunscreen, and the inevitable pulling up of a Key West Grunt. A successful fishing trip meant that all of these things occurred. 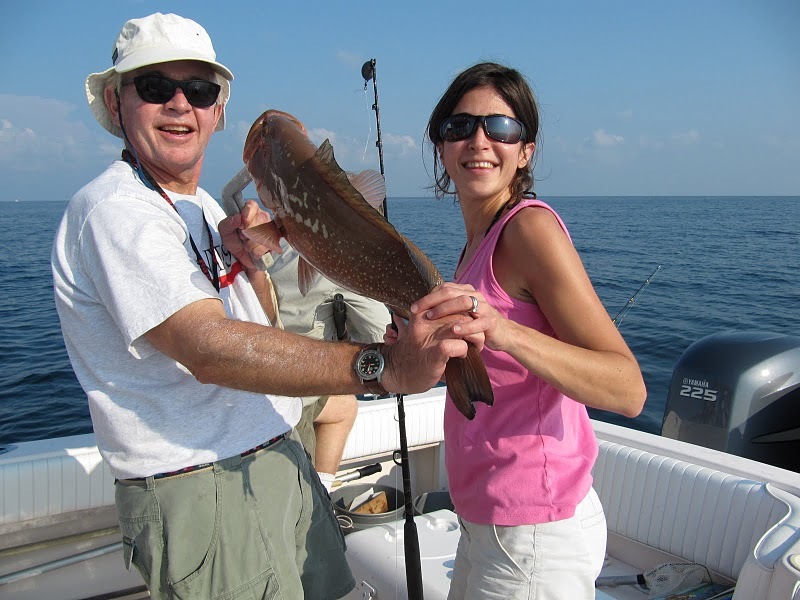 A truly exceptional fishing trip meant that we actually caught a large grouper, a beautiful red snapper, or a shiny Spanish mackerel. While I no longer stand at the bow of the boat (the railing that I used to clutch only comes up to my knees now), I still sit at the front of the boat when my father and I go fishing. The unobstructed view, the rhythmic thud of the boat as it rises and falls, and the occasional spray of salty water makes it my preferred spot for the ride out to deepwater. I took up my perch this Father’s Day when I was lucky enough to get away to Florida for a couple of days and go on a fishing trip with my Dad. My Dad has always worked hard, yet he still found the time to take my brothers and me fishing. These fishing trips allowed us to spend time with our Dad and he with us. And every trip, we found a new appreciation and respect for the ocean and coastline that we were lucky enough to call home. Our father taught us the importance of limits, the effects of tides, and the seriousness of storm clouds that seemed to materialize out of the sea. And in between baiting hooks, nibbles from 60 feet down, and reeling up what could be the biggest fish yet, the smile on my father’s face made it clear that we should appreciate our good fortune. With tar balls washing up on shore just down the coast, this trip with my father was in many ways bittersweet. As oil continues to leak into the Gulf of Mexico, it’s hard to know when our next fishing trip together might be. And, as my mother quickly points out, we are the lucky ones as our livelihoods will not be affected by this disaster. But when I watch the news or read the paper, I’m still filled with a sense of loss; a sense of wishing I had realized the fragility of this place and done more to protect it. Maybe this realization is why this recipe for red snapper tastes so delicious. Capers, lemon and Old Bay seasoning do their part, but I can also taste the salty ocean, smell the warm Florida breeze, and see the blue-green waters in every bite. And perhaps for the first time, I truly appreciate the greatness of the gift my father gave me when he took me fishing. Melt the butter in a large skillet over medium-high heat. 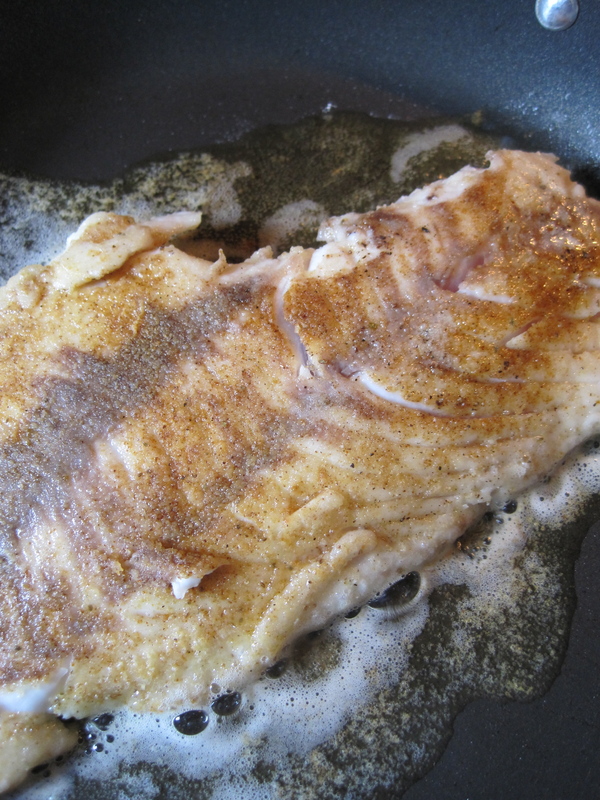 Sprinkle the snapper fillets generously with the Old Bay seasoning. On a small plate, combine the flour and freshly ground black pepper. Lightly dredge the snapper in the flour mixture to coat. Shake off any excess flour. Add the snapper fillet(s) to the skillet and cook until brown (about 2 minutes). Gently flip the fillet and brown the other side. Move the fillet to a oven-proof baking dish. 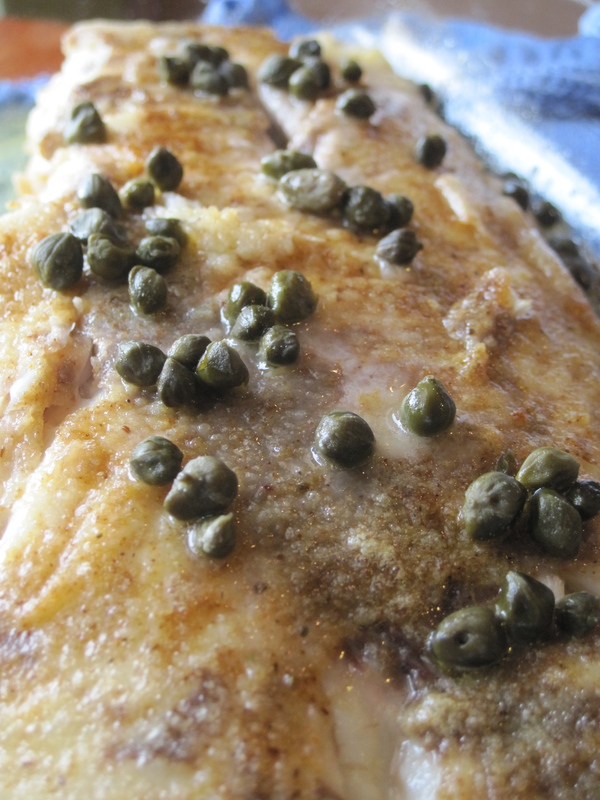 Pour the butter from the skillet over the fish and sprinkle with the lemon juice and capers. 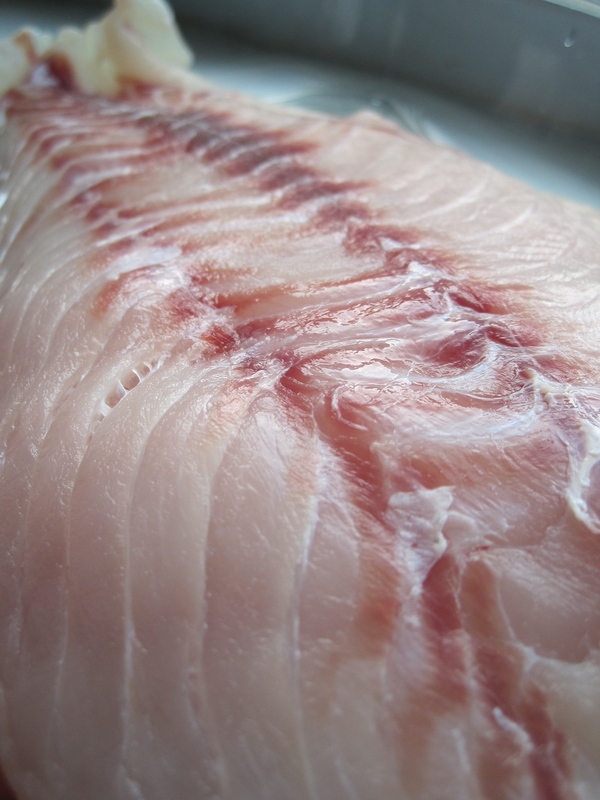 Bake in the oven for 7 to 10 minutes (time will vary depending on the thickness of the fish) or until cooked through. When the fish is ready it will flake easily. Remove the fish from the oven and serve immediately. Enjoy. You write so well that I can smell the salt spraying on me as I bounce on the waves and smell the fish and bait all over my hands, not to mention the sunscreen. I have never cooked snapper as I always thought it was something only a restaurant could do well. 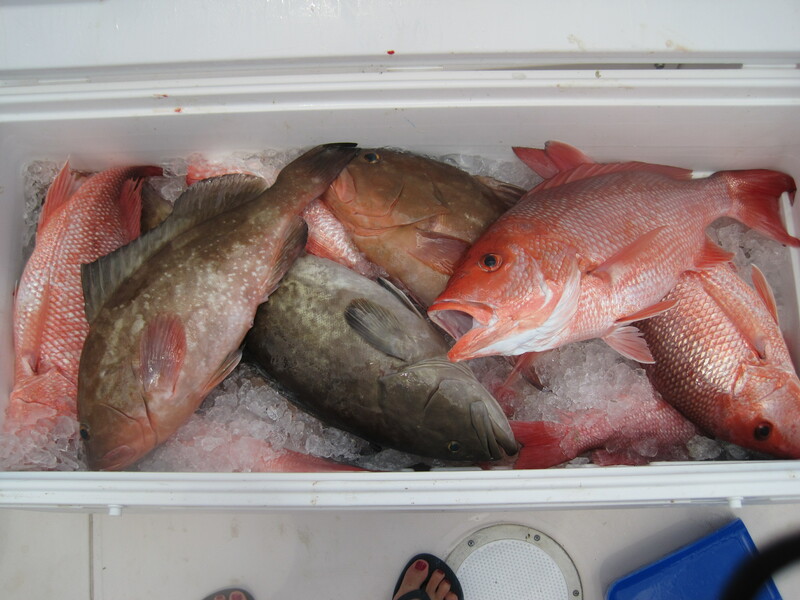 I think I may try it this week…before the snapper sales dry up from Gulf markets! Great photos…. but you are not wearing a life preserver! This made me so sad to read, I remember our fishing trip with your dad and I still have a picture of Margaret and I with our fishing rods on my fridge. I’m thinking of y’all, Alligator Point and our time there will always hold a place in my heart. Bittersweet indeed. This takes me back to pre-Ike and my love of off shore fishing with John and North on our fondly remembered boat. We are oil free in Texas…for now. We appreciate more than ever the fragile and vital eco system in the Gulf as well as the unpredictable concequences of man and nature. Very nice read. I truly enjoy your posts. I made this recipe last week (had an inside scoop from the source), and it also works well with grouper fillets, too. We have made this several times and never disappointed!